Vivek Tiwary will be a special guest at Northeast Comic Con & Collectibles Extravaganza June 20-21 at the Shriner’s Auditorium in Wilmington, MA. Vivek is an entrepreneur and producer who produced “American Idiot” and won the 2014 Eisner Award for “The Fifth Beatle” graphic novel, will be appearing in a panel on The Beatles with WZLX host CHachi Loprete and signing autographs for fans. Here is a current press release about Vivek partnering with Simon Cowell for the new film based on the graphic novel. THE FIFTH BEATLE is a New York Times #1 best-selling graphic novel that recounts the true story of Brian Epstein, the brilliant visionary who discovered the Beatles in a cellar in Liverpool and guided them to unimaginable success. But it’s also the story of how Epstein, of whom Paul McCartney said, “if anyone was the fifth Beatle, it was Brian,” overcame seemingly insurmountable odds and personal demons while bringing the Beatles to the world’s attention and kicking off a cultural revolution in the process. Tiwary, Cowell and IM Global Founder and CEO Stuart Ford will serve as producers, and have already secured an unprecedented agreement with Sony/ATV Publishing for the use of Beatles music to be used in the film. IM Global President of Production Matt Jackson, President of IM Global Music David Schulhof, and Syco Entertainment’s Head of Film Adam Milano will serve as executive producers. The producers also anticipate bringing a director onboard shortly. Tiwary wrote the graphic novel, which was published by Dark Horse Comics, with art created by award-winning artists Andrew C. Robinson and Kyle Baker. THE FIFTH BEATLE has won many major literary awards, including the Will Eisner Comic Industry Award (the comics industry’s Academy Award) and two Harvey Awards (the comics industry’s Golden Globes), including Best Original Graphic Album. It was named a Lambda Literary Award Finalist for Best LGBT Graphic Novel, and has been added to The Rock and Roll Hall of Fame’s Library and Archives Permanent Collection. Stuart Ford founded IM GLOBAL in 2007. The prolific entertainment company operates one of the world’s leading international film sales and distribution platforms controlling a library of more than 250 films which collectively have grossed more than $5 billion in worldwide box office. As a Hollywood producer/financier the company has financed over 20 features, establishing itself as one of the most prolific financiers outside of the major Hollywood studios. The company is also one of the leading international sales agencies in the industry and IM Global’s combined self-produced and third party output enjoyed #1 worldwide box office share outside of the major studios in both 2013 and 2014. In May 2010, Reliance Entertainment, part of Indian conglomerate Reliance ADA Group, acquired a majority shareholding in the company. The company has offices in Los Angeles, New York, London, Mumbai, Mexico City, and Beijing. In mid-2014 the company launched IM Global Television, focusing on developing, producing, financing and distribution of scripted content for network, cable and SVOD platforms, led by former Syfy Channel President of Original Content Mark Stern. In December 2014 the company launched IM Global Music, focusing on acquiring song catalogues, soundtracks, music supervision services and developing music driven film and television content. Run by veteran music industry publisher and financier David Schulhof, the venture recently announced a strategic film production partnership with leading US record label Republic Records, a division of Universal Music Group. SYCO Entertainment is a joint venture between Simon Cowell and Sony Music and is one of the world’s leading global music, film and television production companies responsible for some of the world’s most successful global TV and music franchises. SYCO Entertainment is also the world’s most successful producer of international talent with SYCO Music being the UK’s number 1 record label for both A&R and sales and is record label home for such diverse international recording artists as Labrinth, One Direction, Susan Boyle, Little Mix, IL Divo, Fifth Harmony, Alex & Sierra and Ella Henderson. SYCO’s television assets include the global franchises The X Factor and Got Talent. Local versions of The X Factor are produced in more than 51 territories, with artists discovered by the format selling more than 180 million records worldwide, including 200 number ones and 380 top 10 records. The Got Talent format is officially the world’s most successful reality TV format of all time, holding the Guinness World Records title for the “Most successful TV format of all time” having been commissioned in an impressive 66 territories worldwide. America’s Got Talent also airs in 193 countries around the globe and has been the #1 US summer entertainment series for the past decade. Univision in the US will launch “La Banda” in the fall of 2015, Syco’s latest music-based global TV format. SYCO Film produced the 2013 #1 global box office hit “ One Direction: This Is Us” a 3D concert movie with Sony Pictures and have recently partnered with Animal Logic (The Lego Movie, Happy Feet) to produce a number of music-based live action-hybrid animated movies. Syco Film has a number of additional new movie projects in development. Tiwary Entertainment Group ( tiwaryent.com) is a multi-faceted arts and entertainment venture founded by Vivek J. Tiwary involved in production, financing, consultation, and investment. TEG’s Broadway productions have won a combined 25 Tony Awards from 44 Tony nominations. They include Green Day’s “American Idiot,” the groundbreaking adaptation of the superstar rock band’s multi-platinum album; “The Addams Family” starring Nathan Lane and Bebe Neuwirth; Mel Brooks’ “The Producers,” which set box office records and won a record 12 Tony Awards including Best Musical; “A Raisin In The Sun” starring Sean Combs, which marked a historic Tony win for Phylicia Rashad as the first African-American to win Best Actress; the Stephen Sondheim revival “A Little Night Music,” starring Catherine Zeta-Jones and Angela Lansbury; and Mel Brooks’ “Young Frankenstein.” TEG is currently working with Alanis Morissette and Pulitzer and Tony Award-winner Tom Kitt to adapt Morissette’s breakthrough album “Jagged Little Pill” for Broadway. 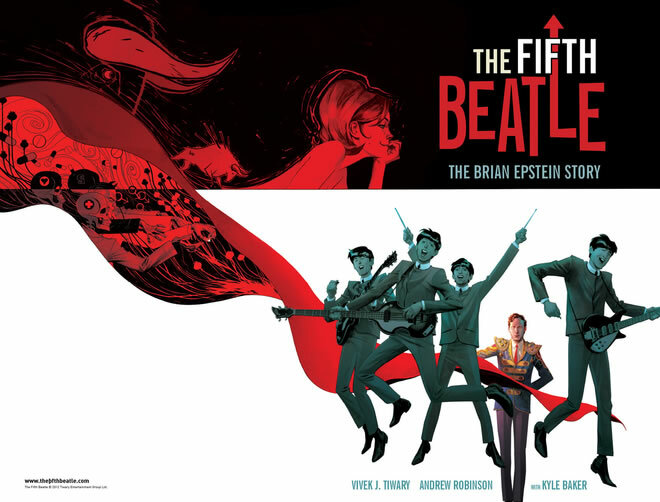 In film, TEG’s forthcoming productions include “The Fifth Beatle”(FifthBeatle.com) a feature film adaptation of Vivek J. Tiwary’s #1 New York Times bestselling graphic novel based on the life of Beatles’ manager Brian Epstein. The film has secured unprecedented access to Beatles’ music, and Tiwary is writing its screenplay and serving as a producer. In television, TEG sold a sitcom pilot “Punk Rock Dad” to CBS based on the bestselling memoir/parenting manual by Pennywise lead singer Jim Lindberg, and is further developing a number of series including “Ascension” a historical fiction / thriller juxtaposing the history of astronomy with mankind’s future in the stars, and “Fractured” a one-hour drama described as “Lost” meets “The Da Vinci Code.” TEG is a strategic investor in Valiant Entertainment a multi-platform company that boasts the third largest universe of comic book characters and has secured a 5-film deal with Sony Pictures. TEG is also an owner of Axial Entertainment, a television production company whose show “How To Look Good Naked” (hosted by Carson Kressley of “Queer Eye for the Straight Guy”) received Lifetime TV’s highest ratings of all time. Other Axial shows include the Style Network’s “How Do I Look?” Joining the founders/creators of Blue Man Group, TEG helped found Counts Media, a company that develops Immersive Entertainment Experiences such as “The Ride New York”. Finally, TEG is a part owner of The Box, a high-profile New York City celebrity nightclub and venue. THE FIFTH BEATLE is an award-winning, #1 New York Times best selling graphic novel and forthcoming feature film recounting the untold true story of Brian Epstein– the brilliant visionary who discovered the Beatles in a cellar in Liverpool, nurtured, protected, and guided them to international stardom, but died painfully lonely at the age of 32. Read more at www.thefifthbeatle.com/story.